After doing some testing with VMware’s vCloud Director, I wanted to configure a multi-cell vCD infrastructure with a network load balancer in front. Of course there are various commercial products (see Eric Sloof’s excellent article on configuring Kemp Load Master), I was actually looking for an open source alternative. pfSense is doing the trick! pfSense is a freeBSD based firewall solution, and the successor of m0n0wall (maybe you know that one). You can download pfSense at www.pfsense.org. I am using the 64 bit 2.0.1 version. You can download the ISO from the pfSense website. A pfSense based firewall and load balancer (in a virtual machine), one NIC connected to the internet, one nic connected to the management LAN. Two vCloud Director cells, both connected to the management LAN. A vCenter Server, also connected to the management LAN. Choose defaults, when asked choose a Quick/Easy Install. Your disk will be wiped, but because you’ve just created a new VM, this shouldn’t be a problem. Choose the multi-processor kernel. After the installation has finished, reboot the virtual machine and disconnect the installation ISO. Now pfSense will boot with it’s default configuration. 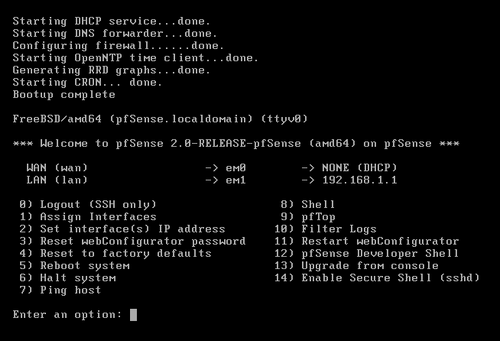 Now it’s time to create a basic configuration for pfSense through the command-line. After you’ve set the IP configuration, you will have a web interface available. I prefer not to use the auto-detection feature, and just type em0 or em1 depending on which NIC your WAN interface is. We don’t have an optional interface available, so just leave empty and press enter when asked. By default your WAN interface will search for a DHCP server, your LAN interface will be configured (by default) with IP address 192.168.1.1. Ok, what’s next? 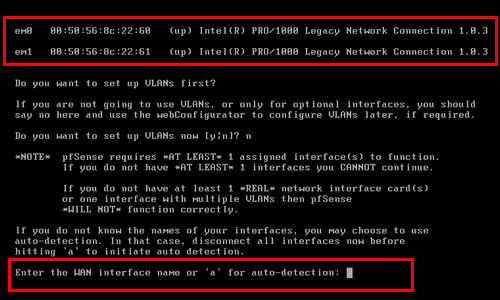 Choose option 2 to configure the LAN and WAN interface according to your network settings. Keep mind that the LAN interface address, that’s the address your vCD cells will connect to, should be configured as the default gateway in your vCD cells. You can choose to use pfSense’s DHCP server if necessary. In my case the WAN interface is configured with 10.0.1.254/24, the LAN interface is configured with 192.168.1.254/24. Ok, now it’s time install vCD and create a basic configuration. Also install a second cell using the response.properties. More information about the vCD installation can be found in the “vCloud Director Installation and Configuration Guide”, available as PDF on the VMware website. The installation isn’t covered here, there are already enough resources available! Console proxy traffic will be accessible through port 443, so on 10.0.1.254:443. The load balancer (pfSense) will balance vCD website traffic on 10.0.1.254:444 to 192.168.1.231:443 and 192.168.1.238:443. pfSense will do a port translation here. The load balancer (pfSense) will balance Console Proxy traffic on 10.0.1.254:443 to 192.168.1.232:443 and 192.168.1.238:443. I will do a little a port translation here. We have to setup the pools and virtual servers feature, it’s a nice-to-have to set up the “monitors” option which is also available (more about that in the To Do paragraph and the end of this article). 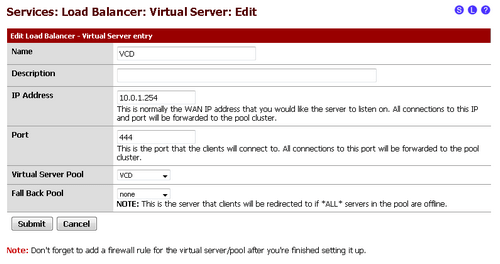 Define a name for the pool, configure the portnumber (443) and add both vCloud director cells to this pool. I’ve configured ICMP as a monitor option, this means a ping is send to a vCD cell to check it’s up and running. Although this is not a very thorough test (the OS of a cell is up and running, but the vCD service is down, the load balancer will still think the cell is available), this option is fine for this first setup. Important: Although these rules will work perfectly, it’s an even better idea to specify the target vCD nodes in the firewall rules. 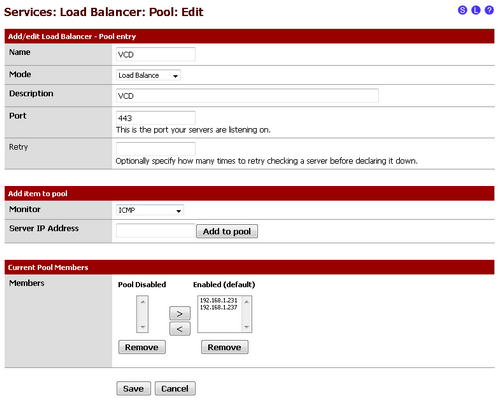 The above configuration can potentially open you pfSense management interface to the “wan” side of the load balancer. 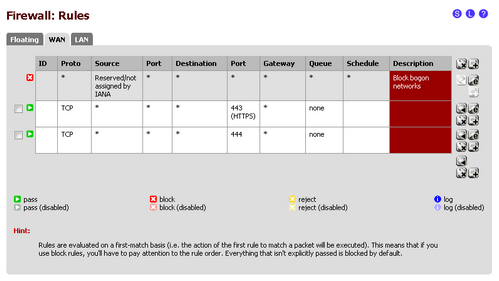 An alternative is to move the pfSense management interface to another port, e.g. port 445. You can set this option in System->Advanced->TCP Port. For the console proxy the configuration is quite the same, the monitor URL should be changed to “/sdk/vimServiceVersions.xml”. In my lab this configuration resulted in two overloaded cloud cells :(. My servers have a rather lean & mean configuration, so I think that’s the problem. I will do some additional testing and post the results here! That’s it for now, your comments are alway welcome! Good article and usefull!!! Im testing ipvsadm+keepalive to do similar failover/balancing. I have a doubt, perhaps it is a typo, u write 192.168.1.238 instead of 237? You’re right! There was a minor mistake in the article, I’ve changed it…everything should be ok now. Thanks for your message. hi, is it also possible to just run the pfsense from the cloud if i have a huge cloud hosting? We tried using pfSense for Load Balancing between 2 vSphere SSO VMs. It works absolutely fine if we test it using a web browser, but for some reason the Inventory Service installer doesnt like it. https://:7444/lookupservice/sdk works fine in web browser. I presume you’re running the SSO nodes in HA mode? Maybe you will need some kind of session affinity; after the initial connection is made, I think the Inventory Service has to connect to the same node each time. I am wondering if this helps!